Of course, it isn’t only about console quality 3D games and slicker graphics. Improvements in CPU and GPU power will also change the way we interact with our devices. Stam talks of having “more processing power to handle more natural language recognition”. ARM’s Bryant concurs that “you can compute parallel tasks such as image-processing tasks on GPU, again because that’s all about efficiency, power consumption and throughput.” For Bryant, more high performance, efficient processing capability on mobile devices, combined with the software ecosystem and high-performance LTE networks, will change the landscape for good. “I really think we’re looking at the future of computing being mobile”. Not everyone sees the future in smartphones and tablets. An Intel spokesperson noted that the smartphone market offered Intel “an incredible opportunity”, but added that “Ultrabooks continue to build momentum” and that “we’re really pleased with the level of innovation and invention being brought into this category”. Nor should we forget the Intel based servers running all the back end stuff. However, this leads us to a twist in the mobile processor tale. As ARM based processors grow more powerful and better tuned to sophisticated multicore arrangements, so ARM’s partners are looking to take them up to the laptop, the desktop and even beyond. A number of companies are already producing ARM based servers, and the company’s own literature targets the Cortex-A15 at low-power all in one PCs and net tops. In other words, the future of mobile processors might turn out to be the future of computing. It’s an arena where new competitors will battle it out, and where Atom might yet end up being a more important technology than Core. Whatever the future holds, we’re seeing advances right now that will transform the devices we use and the way we use them in our everyday lives. Codenamed Wayne, Nvidia’s next chip will pair four to eight 28nm ARM Cortex-A15 cores with a new GPU architecture believed to be based on Kepler. With a unified shader architecture featuring 24 to 64 fully programmable, general purpose GPU cores instead of fixed function geometry and pixel shaders, it promises to be twice as fast as Tegra 3. IT’s OMAP processors power tablets from the Samsung Galaxy Tab 2 to the Kindle Fire HD. The OMAP 5 will have two ARM Cortex-A15 cores for intensive work, two Cortex-M4 companion cores for background tasks, and a PowerVR SGX544MP2 GPU. The Snapdragon S4 is already in high-end smartphones, where its 28nm Qualcomm designed Krait cores outrun the ARM Cortex-A9 cores in most current SoCs. However, Qualcomm’s Adreno 320 GPU, which supports the new OpenGL ES 3 standard for more advanced visual effects, will double the performance of the existing Adreno 225. Qualcomm Snapdragon S4 Mobile Processors 1. 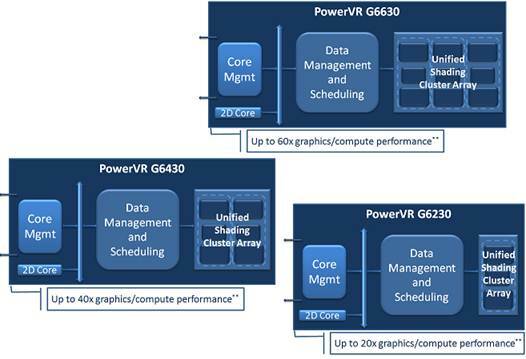 With only two ARM Cortex-A15 cores, but also the first implementation of a PowerVR Series6 “Rogue” GPU, the Nova A9600 is expected to appear in new smartphones from Nokia. Rogue looks set to deliver up to 20 times the performance of existing Series5 GPUs (as used in Apple’s A5, A5X and A6 SoCs) at the same power consumption, in dual-core and quad-core designs. Performance should scale up from 100 gigaFLOPs (the same level as a 2008 GeForce GTX 260) to a dizzying 1 teraFLOP. Samsung’s upcoming SoC couples two ARM Cortex-A15 cores to a quad-core ARM Mali-T604 GPU. The Midgard-based T604 has a unified shader architecture, more memory bandwidth and support for DirectX 11 and OpenGL ES 3, enabling console quality effects such as self-shadowing and High Dynamic Range lighting, while opening up plenty of potential for high-end GPU computing. Exynos 5 Dual should open up Retina-beating resolutions on future Samsung tablets.